A Eurasian Curlew at Esashi 2 years ago today. 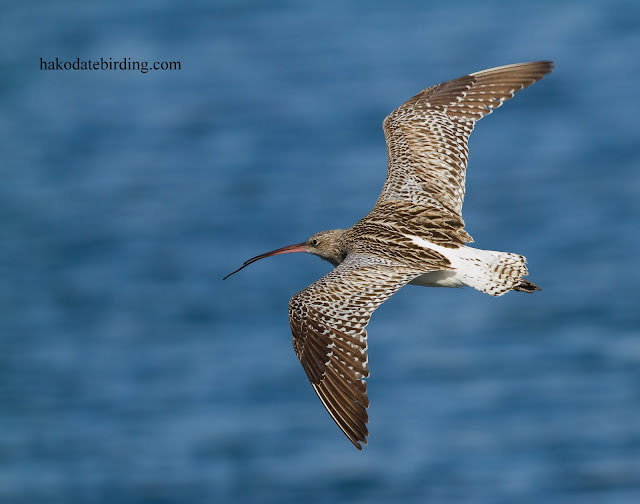 I grew up seeing plenty of these in the UK but in south Hokkaido they are surprisingly rare and this is the only one I've ever seen in Japan (the similar Eastern Curlew is a common passage visitor). Hello Stuart! :) Congratulations of your sighting of the Eurasion Curlew. Great shot! Lovely detailed BiF, Stu. you managed to get the details so beautifully in contrast to the out of focussed background. Is that with the 500 f4? I need me one of them. It's surprising how many birds there are to be seen with some major or minor deformity. There was a one legged Curlew hopping about Cockerham Marsh for a year or two before it eventually disappeared. One legged waders seem to be the most common but I see deformed bills occasionally. The dorsal view is a bit unusual and always a good angle for a BIF, I think. Had to pause a minute to think about what 'dorsal view' means................! !